Tampa Bay Rays pitcher Chris Archer had some trouble putting on his hoodie after finishing up his start in Tuesday night's game in Boston. Archer was taken out of the game after completing five innings of work. He tried to put on his hoodie to get comfortable, but he put it on backwards. Of course, Archer didn't figure it out until he pulled it all the way down and realized his face was still covered. 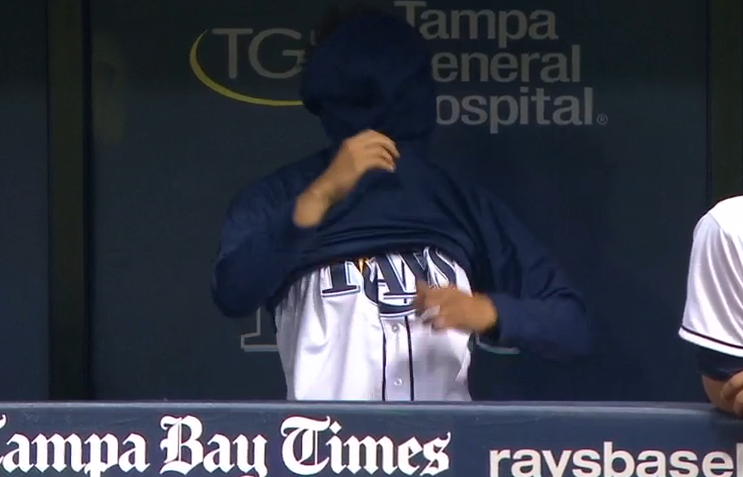 Hey, even major leaguers have wardrobe malfunctions from time to time. The laughable scene doesn't reflect Archer's performance for the night, as he had a good outing, albeit a short one. Archer gave up only two runs (one earned), striking out six batters while walking two. Unfortunately, the Rays offense couldn't back him up, as they could only come up with one run, forcing Archer to take the loss.